The Samsung Galaxy Note 7 has been plagued by reports of exploding handsets, and the risk has been deemed so severe that Samsung has recalled the first batches of the handsets that shipped and replaced them with new Galaxy Note 7 devices. If you haven't sent back your Note 7 yet, make sure you read our guide How to replace your Samsung Galaxy Note 7. With new Samsung Galaxy Note 7 handsets being sent out, Samsung has released information on how you can identify the new Galaxy Note 7, to ensure you're not using an earlier faulty model. Samsung has made it easy to tell if you have a new Galaxy Note 7 by adding a green battery icon that will only be visible on the new versions of the Note 7. This green battery icon will appear in the status bar at the top of the Note 7's screen, as well as on the always-on display screen when the Note 7 is locked, and on the power off screen, which appears when you press and hold the power button. If you've just bought a Galaxy Note 7, then by the time you take it out of the box, charge it up and check for the battery icon, it may be too late for you to easily get your money back if you find you've been sold the old version. Thankfully there's an easy way to make sure the Note 7 you're about to buy is the new version – just check the label of the packaging box and you'll see a square symbol in the top right-hand corner, as shown in the picture from Samsung below. 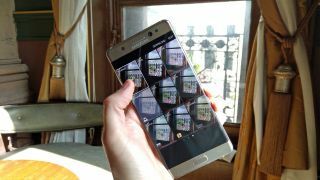 Using these methods you can be confident that you have the new Galaxy Note 7, and you'll be able to operate it safely.